AHWAZ NEWS activism minorities UN Geneva: "Ahwazi Arab illiteracy is due to discrimination"
Geneva: "Ahwazi Arab illiteracy is due to discrimination"
both of the Ahwaz Human Rights Organisation. Ahwazi Arabs are often semi-literate in their native language, but struggle with learning Iran's official language Farsi which is foreign to them, Ahwazi Arab rights campaigner Amir Saedi told at a meeting at the UN headquarters in Geneva today. At a round-table discussion on the rights of linguistic minorities, Amir Saedi outlined Iran's violation of the Convention of the Rights of the Child as well as its own constitution in relation to the education of Arabs. Speaking to an audience that included UN officials and NGO leaders, including Iranian Nobel Peace Prize Winner Shirin Ebadi, he said: "Most Arab villages have no schools... While the illiteracy rate in Iran is about 10%-18%, it is over 50% among Arab men in Khuzestan and even higher for Ahwazi women. In non-industrial rural areas such as Fallahieh (Shadegan), illiteracy among women is close to 100%. "Indigenous Ahwazi students drop out of schools at a rate of 30% at elementary level, 50% at secondary and 70% at high school because they are forced to study the “official language”, Farsi, a language which is not their own. "The learning of Arabic is confined to religious study and is commonly classical Arabic rather than the local dialect. Consequently, Ahwazi Arabs are often semi-literate in their native language, but struggle with learning in a language that is foreign to them." The discussion on linguistic minorities followed condemnation of Iran's human rights record at the UN Human Rights Council in which Iranian delegate Muhammad Javad Larijani's personal attacks on Special Rapporteur on Iran were condemned by the chair. 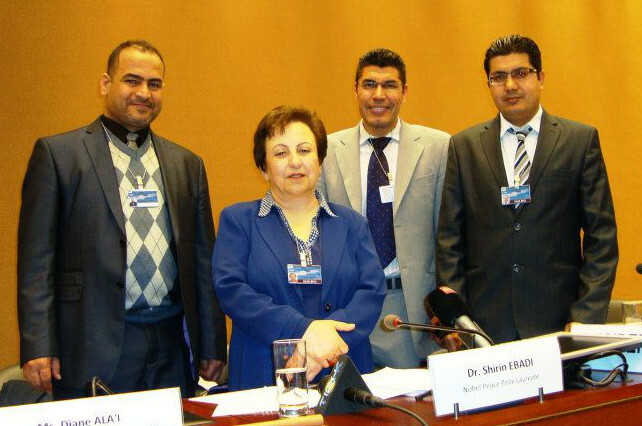 In a long list of rights abuses, UN Special Rapporteur Ahmed Shaheed drew attention to the planned execution of five Ahwazi cultural rights activists. Yesterday, the European Union imposed sanctions on two Ahwaz Revolutionary Court judges for sentencing Ahwazi political prisoners to death, while two Press TV chiefs faced sanctions for broadcasting fake confessions extracted after months of torture.